All urban infrastructure has potential environmental, social and economic impacts. The challenge is to identify, develop or deploy the best tools and thinking in terms of both engineering and planning to tackle these challenges, ultimately making cities more livable and environmentally friendly. Cities represent places where we can make a difference: they are the spaces where we can make the greatest positive gains if we can improve efficiencies or change behaviour. Leaders in the field of urban systems need both technical depth and an ability to see the big picture. Students can develop these two perspectives in the Master of Engineering Leadership in Urban Systems program, which brings together UBC’s expertise in the field of engineering with its strengths in social, long-term and regional-level planning through the School of Community and Regional Planning (SCARP). In addition, students benefit from the courses offered through the UBC Sauder School of Business on various aspects of leadership and business. Graduates of this program will be much in demand by employers. For mid-career professionals, the intense one-year nature of this program is an excellent way to be enriched by UBC’s academic atmosphere, gain access to all the events and activities available on campus, and be exposed to cutting-edge research in the areas of architecture, engineering, planning and business. My background is in environmental science, and I have been doing research on urban systems in the context of climate change mitigation, exploring ways to increase the energy efficiency of the urban environment through low carbon energy and transport systems. New technologies are one solution, but we need to keep in mind that all new technologies are competing with the current system. This means we need to take a broader perspective, looking at the intersection of technology performance and human decision-making. The multi-disciplinary nature of my research fits well with the environmental and sustainability agenda of urban system planning and the goals of this program. 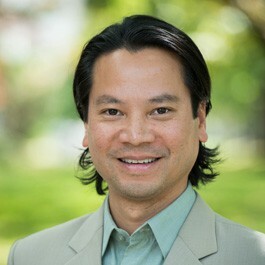 Dr. Martino Tran is assistant professor in Environmental Systems Science at the School of Community and Regional Planning, Faculty of Applied Science. He is a Canada Research Chair (T2) nominee in Urban Systems and an instructor in the Master of Engineering Leadership in Urban Systems program. Dr. Tran is a former Oxford Martin Fellow and a visiting research associate at the Environmental Change Institute (ECI), University of Oxford. He is broadly interested in applying environmental systems and engineering sciences for tackling societal challenges in energy and sustainability, and assessing the long-term performance of urban systems and technologies.